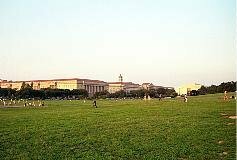 We visited Washington D.C. on Tuesday August 21st late in the afternoon and basically made a circle around the Washington Monument, Jefferson, Lincoln, FDR, Korean and Vietnam memorials. We finished about 10:00 p.m..Here is our virtual tour. 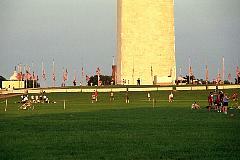 We drove from Falls Church Virginia to Washington in the late afternoon. Rush hour seems reversed - traffic backs up going out of Washington in the morning and into Washington at night. This is where we parked. 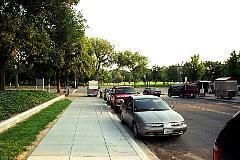 We got on Constitution Avenue running along the Mall and took a left and parked on 20th street. This view is back towards Constitution Avenue and shows our route to the monuments and Mall. The meters only allow you two hours parking, but we got there after 4:00 p.m. so we enjoyed free parking. 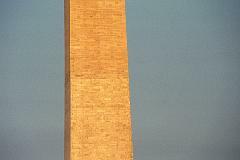 This is a glimpse of the Washington monument. The paths are wide and practically deserted. 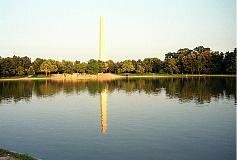 This is a busy tourist time of year, so we surmise that most tourists see the monuments during midday and then leave before early evening. A reflection shot. 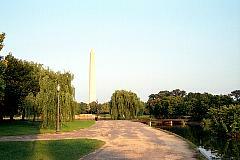 This is not the reflecting pool which contains the image of the Washington Monument, but a large stagnant pool of water to the north of the reflecting pool. As we walked along Margaret read to us about the Washington Monument. Designed by Robert Mills in 1838 it follows the form of an Egyptian obelisk as it rises more than 550 ft above the city: it is the largest masonry structure in the world. 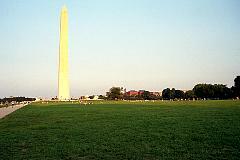 The actual construction of the monument began in 1848 and was not completed until 1884 due to lack of funds and the intervention of the Civil War. A difference in shading of the marble (visible approximately 150 feet up) clearly delineates the initial construction from its resumption in 1876. It is generally considered fortunate that the Greek Doric rotunda Mills planned for the base of the monument was never built. Here is a close up shot of the dissimilar stone. This gives an idea of the expanse of the Mall. The majority of people seems to be involved with sports teams. There are no actual ball fields, but softball practices and games are taking place all over. We definitely beat the crowds by coming in the early evening. To our left is the Museum of American History.